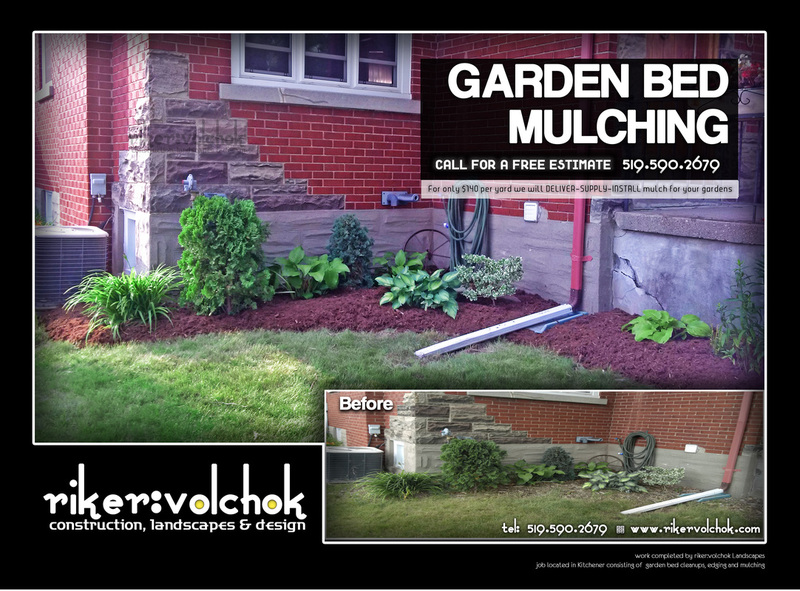 Besides adding to the beauty of your landscaping by providing interesting textures and colours, mulching helps eliminate weeds and improves the quality of your plants . Mulching not only traps in moisture to keep your plants healthy but improves soil structure and drastically reduces the need for weeding by preventing germination. 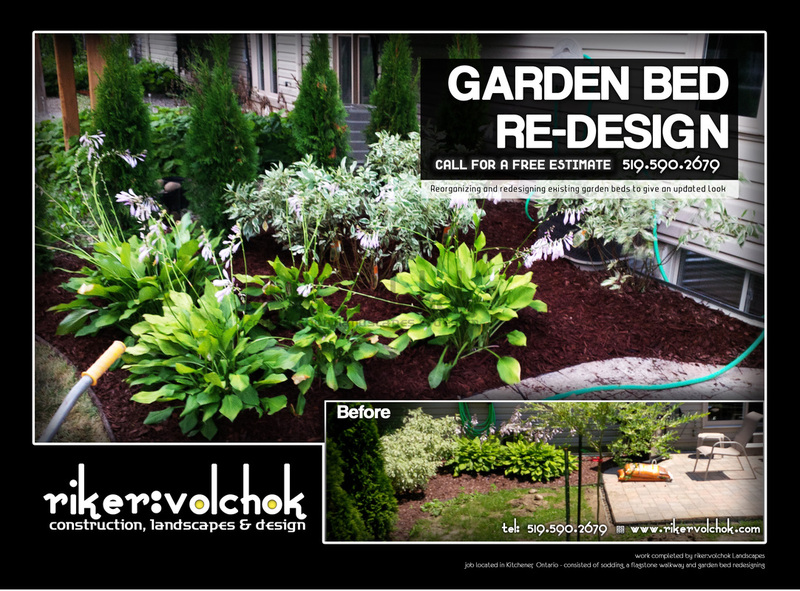 By preventing the top layer of soil from drying out, mulching enables water to move more easily and to be absorbed by the plants. Evaporation of water from the soil can be reduced by as much as 25% when you mulch with a 2”–4” layer meaning less watering is needed. 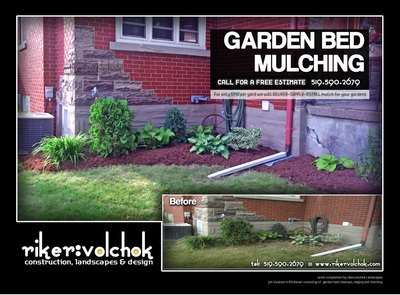 Mulch also keep the soil cooler in the summer and warmer in the winter. 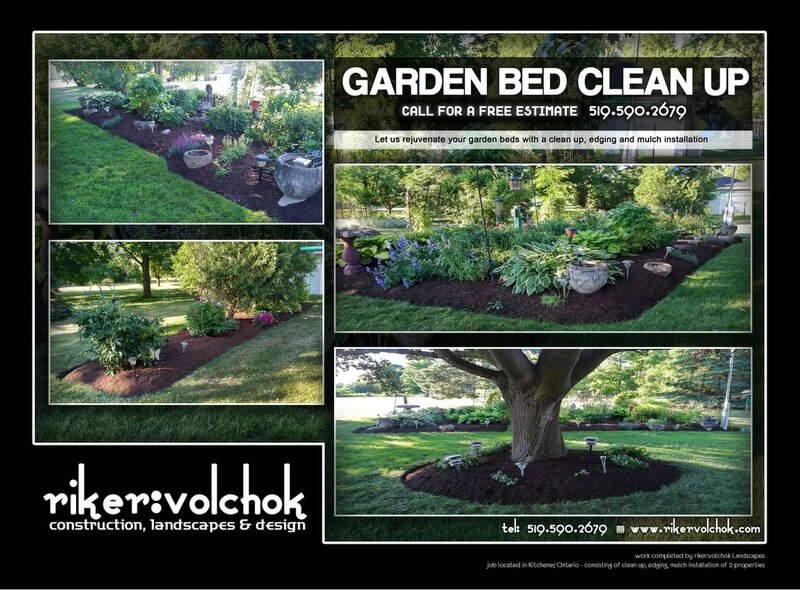 From new trees to shrubs to vines to flowers, we can plant anything in and around your home. 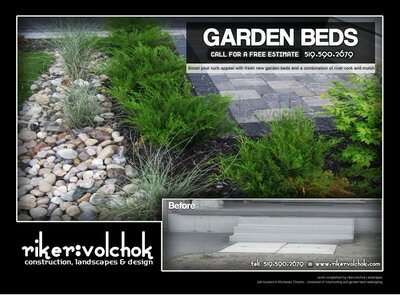 Providing you with both a wonderful landscape now and an even more pleasing landscape later. 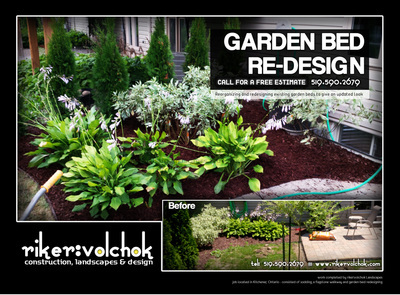 Landscaping is all about crafting the perfect outdoors for your home. For some, that means placing flowers and trees that are fully formed to help create colour and life. For others, it involves placing young plants and watching as they grow along with your family. 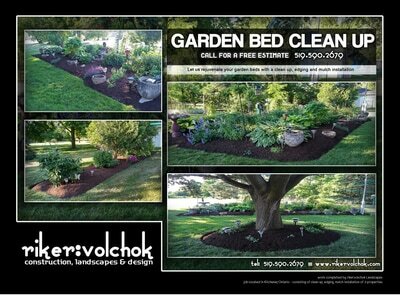 A clean smooth line around a garden bed provides a finished look and a sense of clarity to an area. 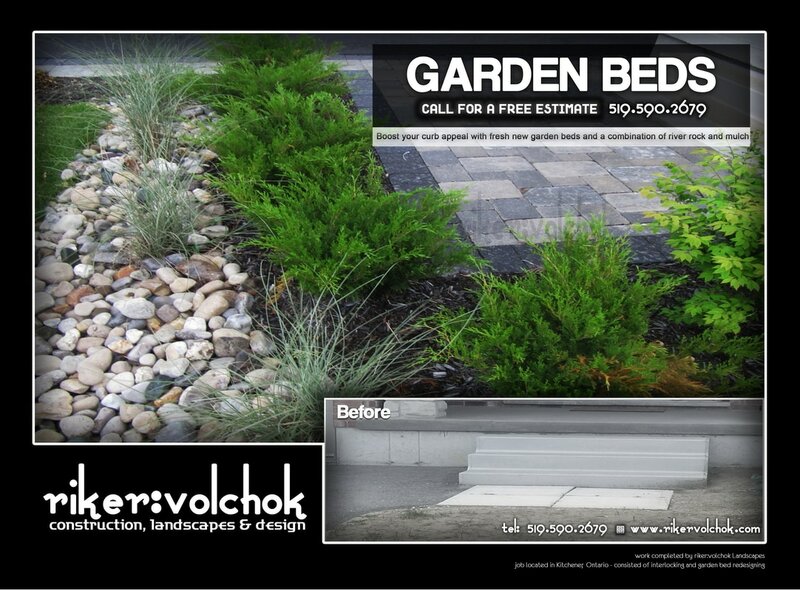 There are a variety of garden bed edging types including stone, aluminum, plastic, composite and natural. 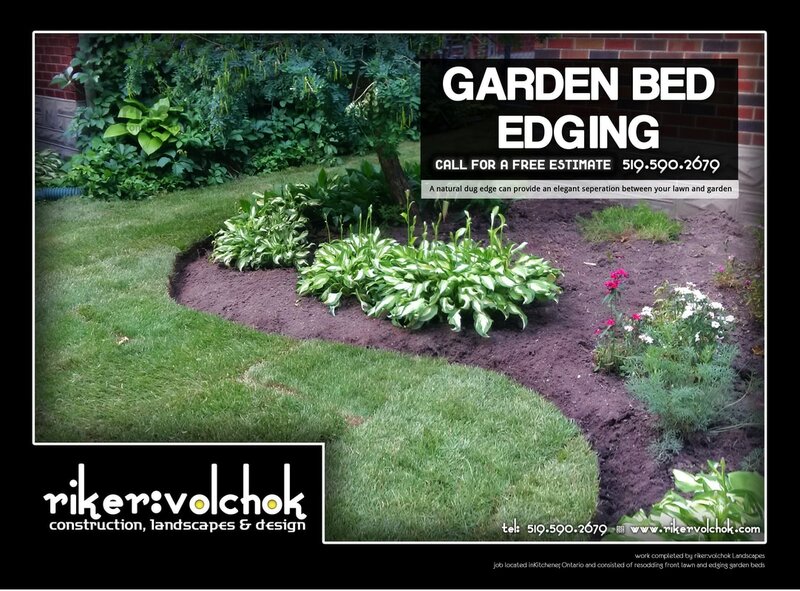 At riker:volchok we work with you to determine the edging that best suits you and your garden bed. 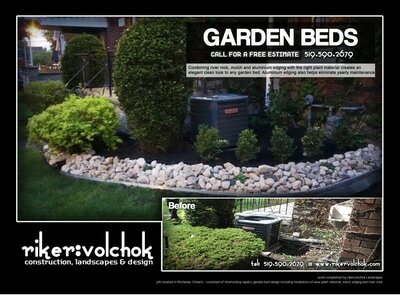 Interested in a natural dug edging as seen in the picture on the right? 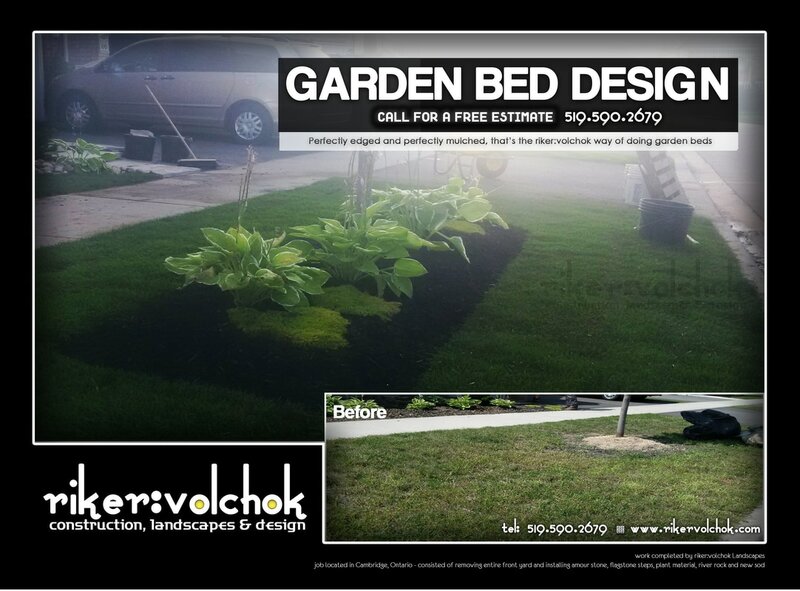 We are highly skilled in providing deep, sharp, straight or curved edges that serve as the stage that sets off your garden bed. 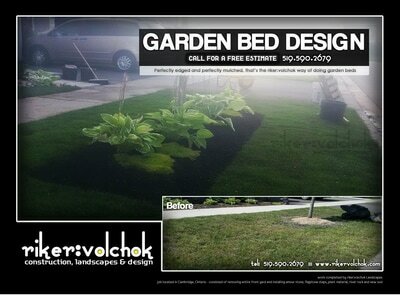 Don't put your hope into inexperienced landscapers who won't provide a deep straight edge. A bad mis-shaped edging can ruin the look of your whole garden. 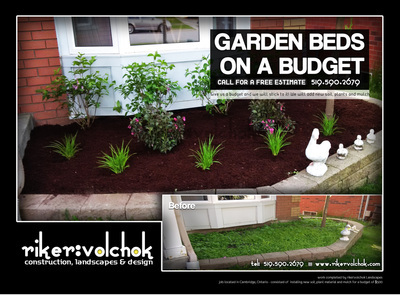 We have the experienced and have been entrusted to edge some of the most expense properties in Waterloo Region. 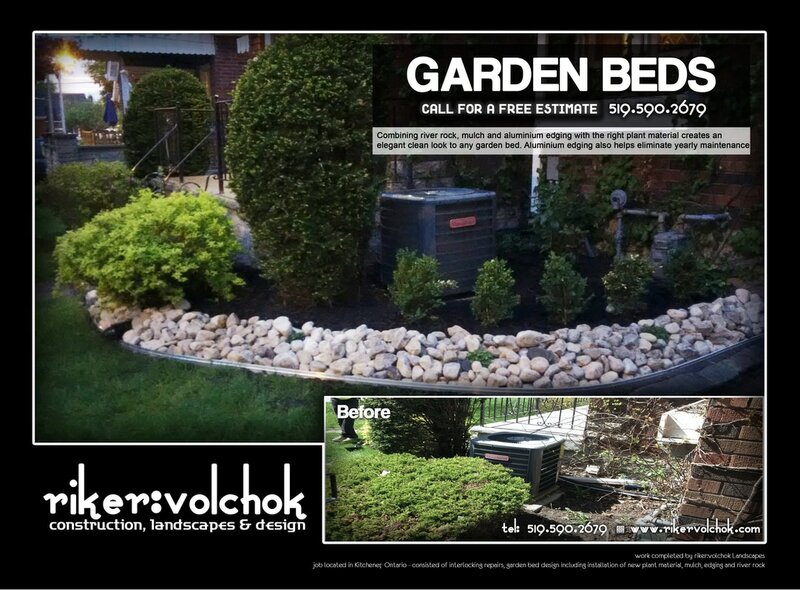 River rocks of all shapes and sizes work well as decorative focal points in garden beds. They add a hard element to balance the soft features of flowers and plant materials. River rocks can be used within a garden bed to provide both a modern and natural look. 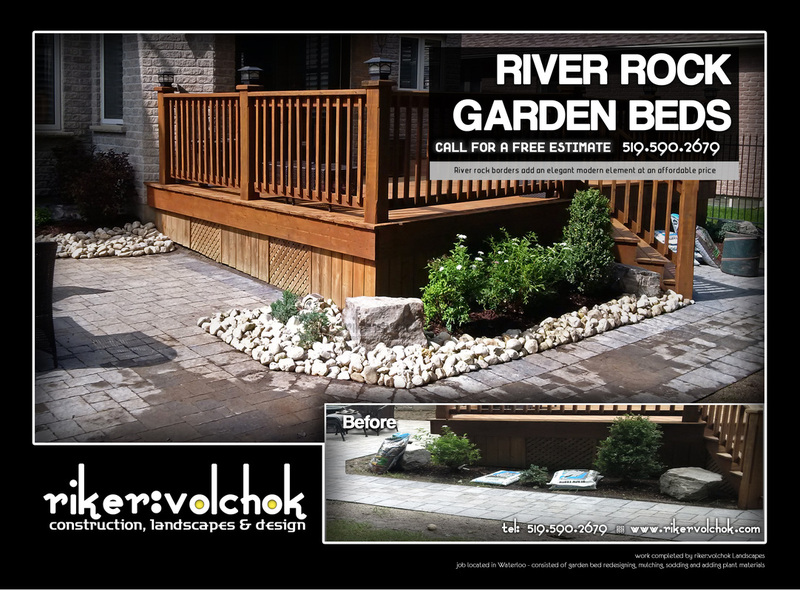 Adding river rocks to a garden provides many benefits from improving drainage to providing focal points to controlling erosion. 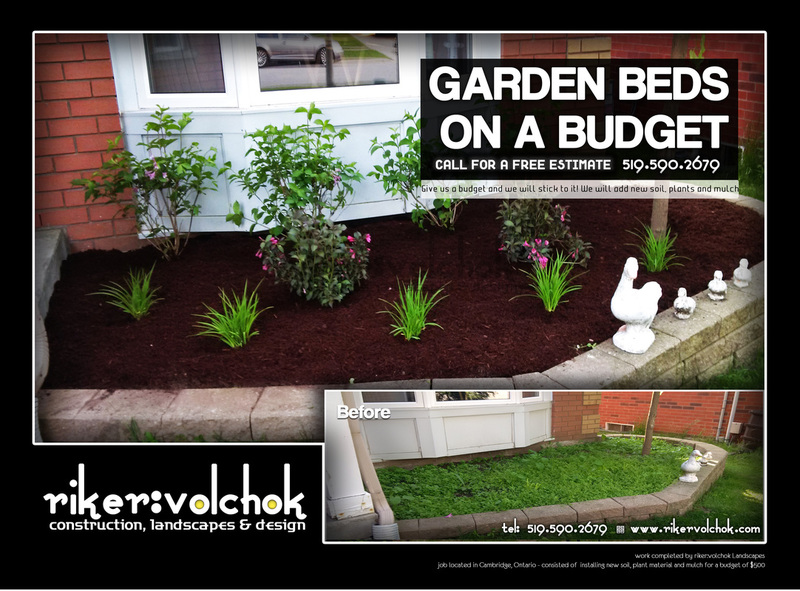 A mixture of both mulch and river rock is an affordable way you can add an updated look to any garden bed and greatly increase the curb appeal of your home.